Table 1. Viral load, CD4 and CD8 T cells count of a long-term non-progressor HIV infected patient. Table 2. Cytokine profile in LTNP, HIV-1 in acute phase and healthy individuals. The HIV-1 initial viral infection may present diverse clinical and laboratory course and lead to rapid, intermediate, or long-term progression. Among the group of non-progressors, the elite controllers are those who control the infection most effectively, in the absence of antiretroviral therapy (ART). In this paper, the TH1, TH2 and TH17 cytokines profiles are described, as well as clinical and laboratory aspects of an HIV-infected patient with undetectable viral load without antiretroviral therapy. Production of IL-6, IL-10, TNF-α, IFN-γ, and IL-17 was detected; in contrast IL-4 was identified. Host-related factors could help explain such a level of infection control, namely the differentiated modulation of the cellular immune response and a non-polarized cytokine response of the TH1 and TH2 profiles. Considering the small number of LTNP patients and the rare opportunity to observe modulation of the HIV-specific response, this study sought to analyze the cytokine pattern by measuring TH1, TH2, and TH17 cytokines for a better understanding of CD4 and CD8 T cells modulation, as well as other immunological factors involved in viral control. The study was approved by the Ethics Committee on Research of the Federal University of Mato Grosso do Sul under protocol number 1.431.913. A 43-year-old female patient initiated medical follow-up in August 2003 at the Basic Health Unit of the Municipality of Ponta Porã, state of Mato Grosso do Sul – Brazil, and continued until 2017. After signing the Informed Consent, two 5-mL samples of peripheral blood were collected by venipuncture without anticoagulant. After separating the serum, the material was stored at −80° C for quantification of TH1 (IL-2, TNF, IFN-γ), TH2 (IL4, IL-6 and IL-10), and TH17 (IL-17) cytokines, using the BD Cytometric Bead Array (CBA) Human TH1/TH2/TH17 Cytokine Kit, according to the manufacturer's instructions, and the BD FACSCanto II flow cytometer. For the analysis of results, the FCAP array software was used. Data from medical records were also collected. Besides HIV infection without ARV, the patient presented some comorbidities such as systemic arterial hypertension, obesity, diabetes mellitus type II, and dyslipidemia. During all years of HIV infection, the patient presented no signs clinical of immunodeficiency. Her recurrent complaints were of gynecological origin, such as alterations in menstrual flow, leucorrhoea and vaginal pruritus, in addition to complaints related to intermittent joint pain. Patient reported no smoking history or alcohol consumption. Because of referred eating-related and anxiety disorders, she was under the supervision of a nutritionist. Laboratory data confirmed HIV infection, dyslipidemia, type II diabetes mellitus, and occasional changes in the urine test. No opportunistic diseases were diagnosed. From January 2004 to June 2017 HIV viral load was undetectable, and the average CD4 count was 1360cells/mm3, without considerable fluctuations (Table 1). Viral load, CD4 and CD8 T cells count of a long-term non-progressor HIV infected patient. copies of HIV/mL of plasma. Cytokine profile in LTNP, HIV-1 in acute phase and healthy individuals. Unpublished data, with an average cytokine dosage of ten HIV, HBV and HCV negative patients (mean age 36.6 years). In HIV-1 infection, it is known that viral and/or host factors could regulate infection control. Among host-related factors, modulation of cellular immune response of LTNP patients are distinct from that of patients with rapid or intermediate progression. Another possibility is a direct antiviral effect of these HIV-specific cells with significantly low HIV-1 replication rate and vigorous CD4 T cell proliferation in response to HIV-1 Gag.7 CD4 T cells were identified as having a cytotoxic phenotype, capable of promoting lysis of autologous B cells coated with the cognate peptide.11 Appay et al.,12 have shown that HIV-1 infection is associated with an increase in circulating CD4 T cells containing perforins, even in PHI, expressing markers of cytotoxic activity in large amounts. The patient presented a non-polarized cytokine production profile, since the production of IL-6, IL-10 (TH2), TNF-α and IFN-γ (TH1) was observed. IL-2 and IL-4 were not detectable, which could be due to the prolonged infection time of 13 years, as such cytokines are part of the characteristic pattern in the initial phase of infection. In addition, the production of IL-17 could be observed in a higher level, which corroborates the hypothesis of a greater production of IL-17 in LTNP patients with viremia lower than 50copies/mL. It is difficult to classify a patient soon after HIV infection or at the beginning of medical follow up, so this LTNP patient's data were evaluated after PHI, but the interference of other factors could not be evaluated. The cells that express perforin regardless of CD8 presence may have a role in controlling the infection. Thus, other studies evaluating HIV-infected patients in the PHI phase are necessary to clarify these mechanisms. Student research grants were provided by the PIBIC-CNPq-UFMS and FUNDECT – CNPq Programs. World Health Organization UNAIDS. Global AIDS update 2016. 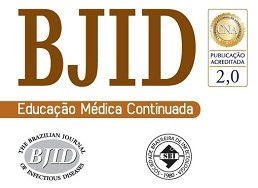 Boletim Epidemiológico – Aids e DST. Ano V – n° 1-27ª a 53ª – semanas epidemiológicas – julho a dezembro de 2015 e 01ª a 26ª – semanas epidemiológicas – janeiro a junho de 2016. Brasília. B. Rodes, C. Toro, E. Paxinos, S. Bassani, V. Soriano. M. Paroli, A. Propato, D. Accapezzato, et al. The immunology of HIV-infected long-term non-progressors – a current view. A.R. Stacey, P.J. Norris, L. Qin, et al. Induction of a striking systemic cytokine cascade prior to peak viremia in acute human immunodeficiency virus type 1 infection, in contrast to more modest and delayed responses in acute hepatitis B and C virus infections. J. Zaunders, D. Van Bockel. Innate and adaptive immunity in long-term non-progression in HIV disease. C. Goujard, M.L. Chaix, O. Lambotte, et al. Spontaneous control of viral replication during primary HIV infection: when is “HIV controller” status established?. B. Vingert, S. Perez-Patrigeon, P. Jeannin, et al. HIV controller CD4+ T cells respond to minimal amounts of Gag antigen due to high TCR avidity. The critical need for CD4 help in maintaining effective cytotoxic T lymphocyte responses. J.J. Zaunders, W.B. Dyer, B. Wang, et al. V. Appay, J.J. Zaunders, L. Papagno, et al. Characterization of CD4+ CTLs ex vivo. A.J. McMichael, P. Borrow, G.D. Tomaras, N. Goonetilleke, B.F. Haynes. J.D.K. Wilson, N. Imami, A. Watkins, et al. Loss of CD4 T-cell proliferative ability but not loss of human immunodeficiency virus type 1 specificity equates with progression to disease. N. Imami, A. Pires, G. Hardy, et al. A balanced type 1/type 2 response is associated with long-term nonprogressive human immunodeficiency virus. S.C. Liang, X.Y. Tan, D.P. Luxenberg, et al. Interleukin (IL)-22 and IL-17 are coexpressed by Th17 cells and cooperatively enhance expression of antimicrobial peptides. F. Yue, A. Merchant, C. Kovacs, et al. Virus-specific interleukin-17-producing CD4 T cells are detectable in early human immunodeficiency virus type 1 infection. M. Salgado, N. Rallón, B. Rodés, et al. Long-term non-progressors display a greater number of Th17 cells than HIV-infected typical progressors. L. Ndhlovu, J. Chapman, A. Jha, et al. Suppression of HIV-1 plasma viral load below detection preserves IL-17 producing T cells in HIV-1 infection.